Costa Maya Watersports - Awesome Excursions! Costa Maya is a blossoming watersports destination. There is almost everything here! You can go snorkeling, scuba diving, fishing, paddle boarding, kayaking, even some extreme sports like wave runners or the hot new fly boards! Then of course after you're done getting wet, you can try out one of our exclusive all-inclusive beach breaks to spend the rest of your day in Costa Maya. THE BEST PRICES IN COSTA MAYA ON WATER SPORTS !! 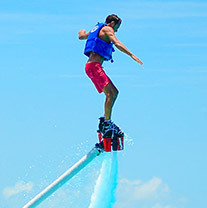 Flyboarding is the hottest new activity to the Costa Maya region. You are towed out by jet ski and then you let 'er rip! You are lifted off the ground like superman, and before long you'll be doing tricks and amazing acrobatics. If you haven't tried it, you'll want to! Wave runners are always popular, and Costa Maya is no exception. This excursion takes place right at the beach, and you can spend the rest of the day enjoying the sun and sand. 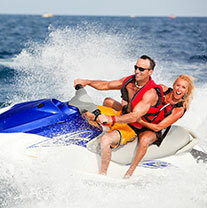 We offer a great price on wave runners and jet skis. Combine these with the Pez Quadro beach break and you'll save even more! Snorkeling is one of our great watersports selections as well. You'll head out to the world's second largest barrier reef to snorkel and see tropical fish. Very fun. We have private snorkeling tours, shared snorkeling tours and more. Another awesome water sport is stand up paddle boarding. We offer a wide variety of fun SUP activities, and combine them with our all-inclusive beach break to make a whole day of fun in Costa Maya. Q: I'm on a Cruise Ship, Can I do your Water Sports? A: Absolutely! Combine these watersports with one of our beach breaks for best prices and a full day of fun in the sun! A: All of these activities are located right in Mahahual village, just a couple minutes by taxi from the cruise pier. Very easy.